Wright, David. "Lines on Retirement, after Reading Lear." 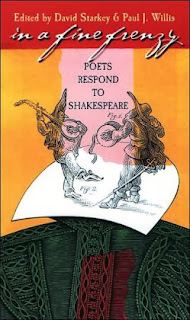 In a Fine Frenzy: Poets Respond to Shakespeare. Ed. David Starkey and Paul J. Willis. Iowa City: University of Iowa Press, 2005. 94. A few weeks ago, I was trying to track down a poem by David Wright. It was a darkly comical piece relating to retirement and reflecting on King Lear. I found it relatively easily, though one blog claimed that he was both deaf and dead—dead since 1994 and deaf, presumably, before that. My latest conversation with him reveals him to be neither. Possibly even more exciting than finding the poem was the epiphany of realizing that the poem was now in a collection of Shakespeare-related poems by modern poets. I was thrilled, and I ordered the book immediately. Readers may know that I taught a course called "Modern Shakespearean Fiction" and that I was looking for poems just like these. This week, I'm highlighting the best poems from the collection, starting with the one that enabled me to find the others. Avoid storms. And retirement parties. the feather, the mirror held to our lips. your children’s ragged praise and that of friends. Go ahead, take it off, take it all off. into your hair. Bellow at cataracts. beer. So much better than making theories. We’d all come with you, laughing, if we could. Links: Wright's poem at Poets.org. Wright's blog, which focuses on ekphrastic poetry.